When concentrated flows or water fluctuations cause scour, consider the Presto GeoRunner® Scour Protection Mats. 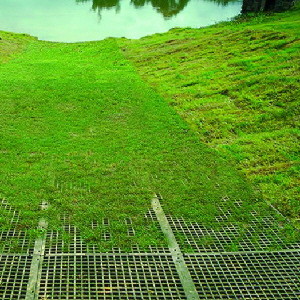 Durable GeoRunner® mats protect embankments from erosion caused by surface flow and are ideal for protecting channels, shorelines, culvert outfalls and areas exposed to concentrated flows. GeoRunner panels are bundled in units of 6 and sold only in multiples of 6. 42 bundles of six are stacked on each pallet = 252 GeoRunner units per pallet.